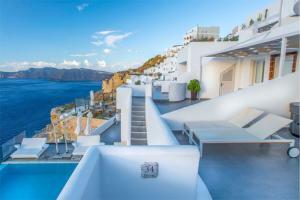 Set in the village of Oia, overlooking the Aegean Sea, this hotel offers a slice of paradise. 17 beautiful suites reflect the Cycladic style, offering a luxurious retreat with either a private pool or a Jacuzzi. Enjoy spectacular views of the Caldera from your private veranda. Indulge in delicious Greek cuisine against a stunning backdrop or rejuvenate at the full-service spa. Located in Oia, just a short walk from the Naval Museum.